Chelsea are into the Carabao Cup final! 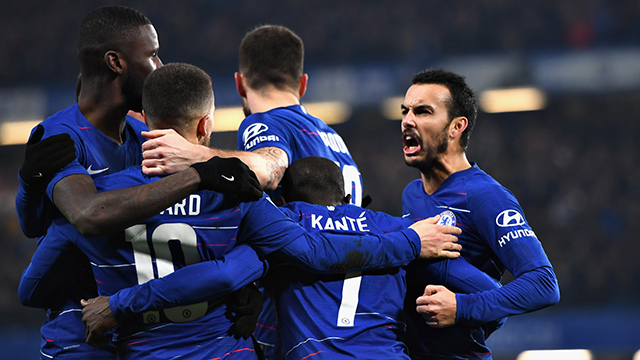 Four perfect penalties of ours, allied with two Tottenham misses, sent the Blues through to next month’s Wembley showpiece after the teams couldn’t be separated following an engrossing derby at the Bridge. Pedro formed on Maurizio Sarris’ line up and played 76 minutes of the game with a fine performance. The Spaniard had a hand on the building of the second goal by Eden Hazard. Willian, Cesar Azpilicueta, Jorginho and David Luiz all kept their cool, while Dier blazed over and Kepa kept out Moura with a full-stretch dive to his right, sparking delirium inside the Bridge. Wembley beckons! Andreas Christensen had a groin injury and missed out. Tottenham, without the injured Harry Kane and Dele Alli, and with Son Heung-Min at the Asia Cup, selected Llorente in attack. Harry Winks and Erik Lamela were among the other fresh faces from the first leg.